C-Section Death Rate Up To 50 Times Higher In African Countries Than In Wealthy Countries : Goats and Soda A new study on maternal mortality finds that the death rate is up to 50 times higher in many African countries than in high-income countries. Doctors treat a baby whose mother underwent a cesarean section in Sierra Leone. Doctors Without Borders has worked to help reduce the country's high maternal mortality rate. "This was not an uncommon complication. We should have been prepared to manage this," Maswime says. But they weren't. "All of us at this hospital were quite junior — there were really no specialists." The best course of action, they decided, was to move the patient to a bigger hospital. "That was maybe 14 miles away, so we needed to airlift her," Maswime says. But coordinating the transfer took nearly eight hours. "She died minutes before the helicopter arrived." "What this highlights is the fragility of the health-care system across Africa," Maswime says. And of 3506 infants born, 153 died soon after — a rate that's twice the global neonatal mortality rate of 1.9 percent. This study makes clear that mothers are suffering from preventable or easily-solvable complications, says Dr. Bruce Biccard, an anesthesiologist and professor at the University of Cape Town who led the research. "The human resources — the staffing — required to care for mothers just isn't there, across the continent," he says. "Another important finding is that about three-quarters of the women in the study had an emergency cesarean," Biccard says. That's likely because many women don't get proper prenatal care — they don't see gynecologists who are able to identify problems before delivery. Many of the women in the study had a high risk of complications due to pregnancy-induced high blood pressure called preeclampsia or a high risk of hemorrhage. "Some of these women might have fared better if they had come to the hospital earlier," Biccard says, or had scheduled C-sections. 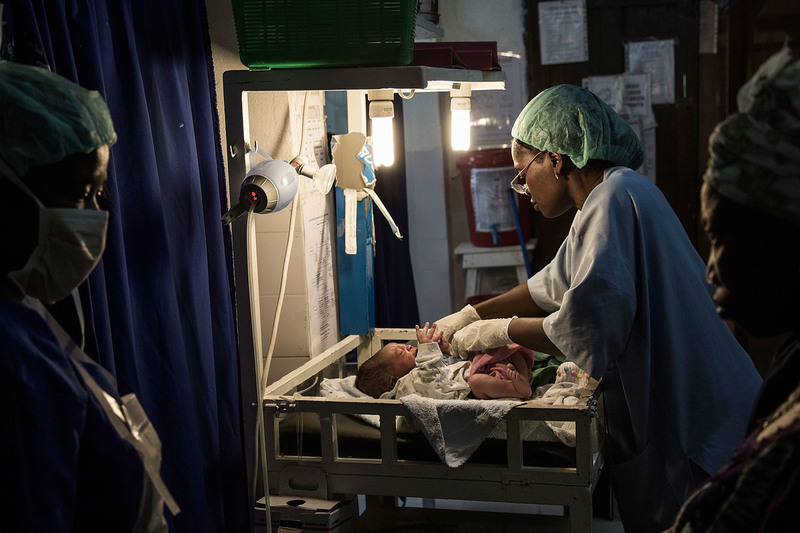 "While in high-income countries, we worry that the rate of cesareans is too high, in Africa, it's the opposite," says Kavita Singh Ongechi, an associate professor of maternal and child health at the UNC Carolina Population Center. A lot of African women who need C-sections aren't getting them — and those who do get them aren't receiving the best quality of care, she notes. "This study definitely confirms a lot of what we already knew about access to maternal health care in Africa," says Singh Ongechi, who was not involved in the research. The hospitals that participated in the Lancet study were mostly larger, university-affiliated hospitals, she points out. "I imagine outcomes would be worse in a lot of rural hospitals, where there are even fewer high-level health providers." "When it comes to maternal mortality, the signal is consistent across the countries where we've worked," he says. For Dr. Ana Langer, who leads the Women and Health Initiative at the Harvard T.H. Chan school of public health, one of the most telling findings in the study is that more than 10 percent of women undergoing a C-section died from complications due to anesthesia. "That just shouldn't happen if the anesthesia is properly administered," she says. "It's important to remember that these are the deaths of young women, and they're preventable." And yet, Langer adds, "as we say often, unfortunately, there aren't any magic bullets." What's needed is more funding, more staffing, better training and equipment. "Increasing our resources twenty-fold all of a sudden just isn't a viable solution," says Biccard. For now, he's working to develop techniques to help understaffed hospitals better assess and attend to the needs of pregnant mothers. Maswime has been touting "hemorrhage kits" for hospitals that contain the supplies necessary to treat the most common delivery complications. "It will take a lot of thinking and innovation and creativity," Biccard says. "But there will be progress."